This was the series that brought AR Torre to my attention many years ago. Deanna Madden was one of those characters that always was a bit of a mystery, yet despite all her faults and her eccentricities she was one character that had totally endeared herself to me. Yes, I felt sorry for her, yes, I empathised and sympathised but most of all I was intrigued, who or what had made Deanna, Deanna? In this book we delve deeper into Deanna’s psyche but this is definitely a story of personal growth for Deanna. The self-imposed reclusive is slowly beginning to realise that there is a life outside of 6E. 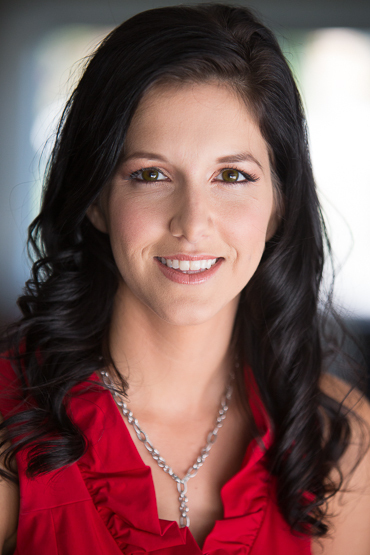 Just as she begins to make those baby steps to a little freedom something happens that leads Deanna to question everything and puts her right back to square one. Deanna is facing her biggest challenge in this book, who is friend, who is foe? Who can she trust? Can she trust herself? Jeremy, our favourite UPS man really tries to get through to Deanna, he starts to push her boundaries little by little and tries to bring her out into the open. He becomes a bit more forceful in this book, but for the good and he is gentle with it. He knows he has to tread carefully for Deanna’s sake as well as his own. He loves Deanna, he can’t help it, but he needs a little “normal,” however, as we all know, there is nothing “normal” about Deanna. I loved Mike in this book, he is Deanna’s one constant and someone that she can rely on, always. He is the only person that knows all there is to know about Deanna and he is the one person that is always there, no matter the time or circumstances. He really steps up to the plate in this book and is one awesome friend. Everyone needs a Mike. 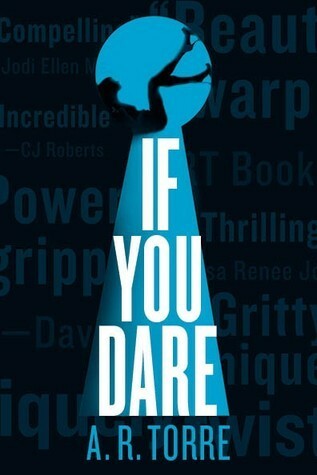 This book had me on the edge of my seat from beginning to end, my heart was in my mouth for most of it. AR Torre has always packed a punch with this series and If You Dare is no different. 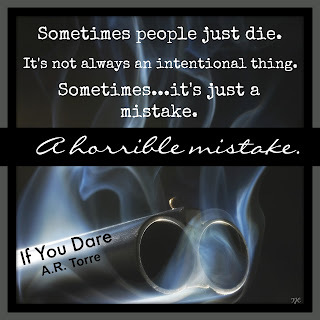 With multiple POV’s and flips from past to present, AR Torre slowly drip feeds you the pertinent information that you need to understand what is actually going on. The first half of this book I was as confused as hell, but in a good way. It is this confusion that leads you to question everything you are reading, looking for clues and that one piece of information that could potentially put the lid on the can of worms that is If You Dare. AR Torre masterfully weaves that tangled web and you are the poor fly caught on the outskirts waiting for that big bad spider to come and gobble you up. The anticipation of being spider dinner is forever present as you struggle against what you are reading, yet still manage to absorb. But it is your impatience and fervour to understand that keeps those pages turning wildly and made this a truly un-put-downable read for me. Once again, I applaud AR Torre for another astounding read. Those that follow me know that Hollywood Dirt is my favourite read of the year so far and now we have another contender for that spot, If You Dare. It seems AR Torre is getting a little greedy and wanting those top spots all to herself. But this just goes to show her diversity and her talent, from one extreme to the other the words speak for themselves, whether it be romantic comedy or mystery suspense, this woman knows how to write.